Trains between Glasgow and Carlisle cancelled until February while repairs are carried out. Train services between Glasgow and Carlisle on the West Coast Main Line have been cancelled until February due to damage caused by Storm Frank. Passengers face taking a replacement bus service or a diverted train via Dumfries, adding 90 minutes to their journey, until the repairs are completed. Rail infrastructure operator Network Rail said Storm Frank caused significant damage to the Lamington Viaduct near Lockerbie and repairs are expected to last until the end of January, with the first trains back on the line on February 1. The storm damaged a viaduct supporting pier, leaving the structure unstable and engineers plan to continue investigations until the end of next week before starting repairs. Phil Verster, managing director of Network Rail Scotland, said: "Our engineers have been working round the clock for the past few days, in extremely difficult conditions, to try and gain access to the viaduct so that we can understand the scale of the damage that has been caused by Storm Frank. "While that assessment work is not yet fully complete, it is clear now that the damage is significant. "We are already working on solutions as to how we get the viaduct fixed and allow us to safely run trains over it again. However, it is likely that it will take us to the end of January until we can reopen it. If we can get it opened earlier, then of course we will. However, customers should plan for the work to continue until the end of the month." He advised customers to check before they travel on the line. Virgin Trains apologised for the disruption and plans to run replacement buses between Glasgow and Carlisle and trains via Dumfries. East Coast services are expected to be busier than normal. Phil Bearpark, executive director of Operations for Virgin Trains on the West Coast, said the diverted train route is "limited and will also add around 90 minutes to the journey". 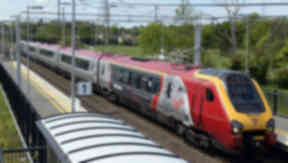 He said: "Safety is always the most important consideration on the railway and we support Network Rail's decision to close the West Coast Mainline between England and Scotland until they are sure it is safe to run trains. "Virgin Trains tickets are being accepted on our East Coast services between London King's Cross and Edinburgh, and also on Cross Country services between Birmingham and Glasgow. Passengers should expect these services to be much busier than usual, and anyone who can postpone or cancel their journey should seriously consider doing so. We will of course give a full refund for anyone who decides not to travel." First Transpennine Express services between Manchester and Scotland have also been hit by the closure. Paul Watson, operations director at First Transpennine Express, said: "As an industry however we have been working hard to ensure that cross border travel is available. Customers are advised to either travel via the East Coast Main Line, changing from Manchester at York or Newcastle for services to Edinburgh or using the coach replacement services between Carlisle and Glasgow."